Robert Heron Bork was an American judge and legal scholar who advocated the judicial philosophy of originalism. Bork served as a Yale Law School professor, Solicitor General, Acting Attorney General, and a judge of the United States Court of Appeals for the District of Columbia Circuit. 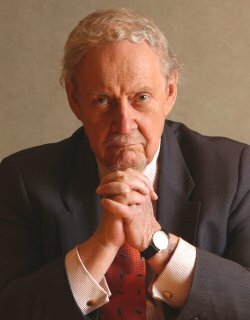 Robert Heron Bork (March 1, 1927 – December 19, 2012) was an American judge and legal scholar who advocated the judicial philosophy of originalism. Bork served as a Yale Law School professor, Solicitor General, Acting Attorney General, and a judge of the United States Court of Appeals for the District of Columbia Circuit. In 1987, President Ronald Reagan nominated him to the Supreme Court, but the U.S. Senate rejected his nomination. Bork is acclaimed also as an antitrust scholar, where his once-idiosyncratic view that antitrust law should focus on maximizing consumer welfare has come to dominate American legal thinking on the subject.